The Icom IC-25A is a compact 2 meter FM mobile transceiver providing 25 watts of power. There is also a setting for 1 watt output when less power is needed. The green LED display is readable over a wide range of light. This radio has 5 memories and dual VFOs. It also has programmed scanning or memory scanning. Dual speed tuning (5 or 15 kHz steps) is provided. There is a NOR/REV capability to monitor repeater input frequencies. The supplied HM-14 DTMF hand mic has Up-Down. Requies 13.8 VDC at 9.5 Amps. The Icom IC-25H is the same as the IC-25A, but transmits with 45 watts (instead of 25 watts) and requires 9.5 Amps. It has a large heat sink in the back. 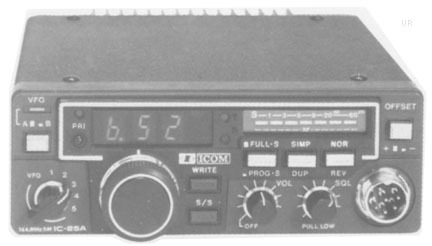 The Icom IC-45A is the same as the IC-25A, but operates on the 440 MHz band instead of 2 meters with 1 or 10 watts. The Icom IC-120A is the same as the IC-25A, but operates on the 1260-1300 MHz band instead of 2 meters with 1 watt. Requires 2 Amps.